Life at The Saybrook at Haddam focuses on independence, wellness and involvement. By involvement, we mean participating in the activities and events we host on a daily basis for plenty of social, educational, creative and physical opportunities. We also mean residents play an active role in helping others and making our retirement community (and the surrounding greater community) the best it can be. Many independent residents continue to be active members in their churches, synagogues, local libraries, museums, and other volunteer organizations. Sometimes they organize collections for non-profit groups at The Saybrook at Haddam to help meet needs within the larger community. These volunteer hours are invaluable and have an estimated $77 billion impact on the country’s overall economy. Other residents look for ways to help out right here within our community. Some make regular visits to the Safe Harbor Memory Care neighborhood to spend time with those suffering from memory-related illnesses. They help with craft projects or puzzles, join in sing-a-longs, or share a meal with a friend. These connections are crucial to supporting a high quality of life for everyone involved. Residents also help plan recreational and cultural activities and trips to museums, theaters, and concert halls throughout the region. They provide suggestions and input on the types of educational and artistic programs they would like to see at The Saybrook at Haddam. They help take care of the many indoor and outdoor gardens, and they love to help decorate the community for special events and occasions. Oftentimes a resident will share something from their home with the community for all to enjoy – another form of contributing to the greater good. One resident displays her oversized creche in the front lobby at Christmastime. Another donated her upright piano to the Safe Harbor neighborhood. Another placed a hand-made and fully furnished doll house in the hallway for all to enjoy. These efforts help make The Saybrook at Haddam feel like home – and make ours a special place to be. All residents play an equally important role in volunteer efforts– sometimes without even realizing it – by being a friendly audience. We often have young performers (musicians, singers, dancers) from local schools share their talents by entertaining us. These events give the young students a chance to perfect their performance skills (perhaps even overcoming some stage fright), while giving the audience a wonderful shared experience. We also enjoy visits from the Girl Scouts who spend time with us on service projects so they can earn badges and reach goals. Of course, we also welcome high school and college students who need to earn required volunteer hours to participate in a whole host of projects and activities with us. Their interaction with residents is inspiring and motivating. Each of these types of participation (“volunteerism”) is encouraged every day at The Saybrook at Haddam – and for good reason. 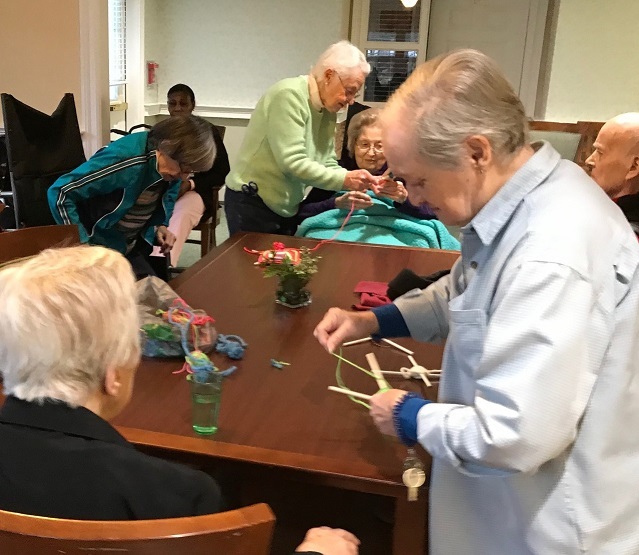 According to the Corporation for National and Community Service, seniors benefit from using their lifetime of skills and experience to meet community needs, and “giving back” helps them stay active and healthy. We believe this to be true and we support this in every way we possibly can. Come see how powerful that is!